MAC products seem to get a lot of love from the makeup blogging world, and I have to confess a lot of times I find all the rave reviews floating around a bit overwhelming. It took me a while to actually check out products at MAC counters, but over time, I have found quite a few gems in the brand. MAC Uninterrupted is one such find and definitely one of my favorite eyeshadows. 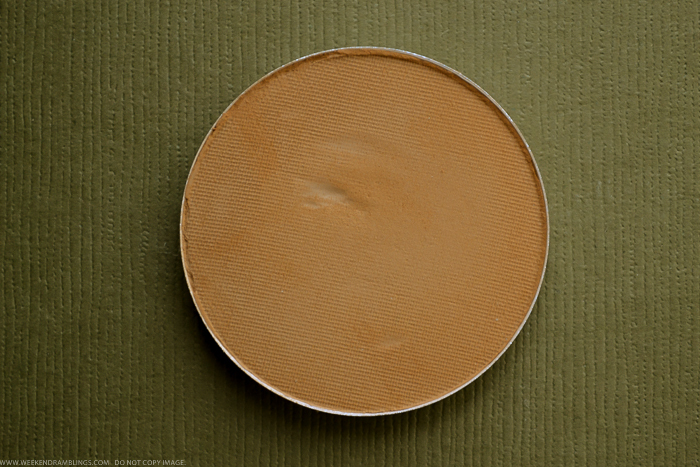 MAC Uninterrupted is a warm, mustard-brownish matte eyeshadow. It's part of the Pro Longwear Eyeshadow range, so the pan (I have a refill) is bigger than the regular eyeshadows and also pricier. 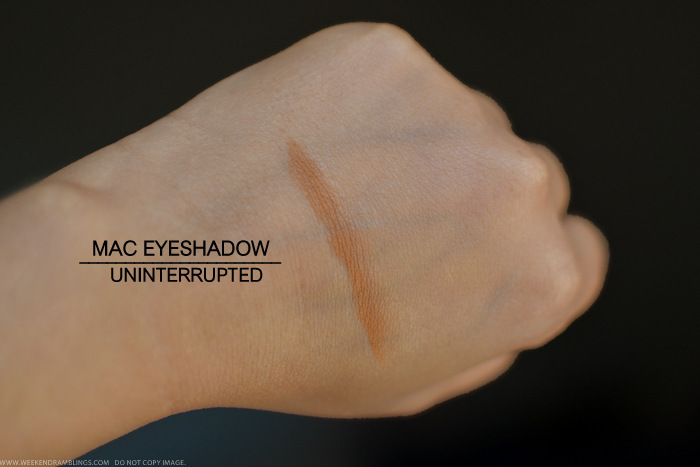 This is the only Pro Longwear eyeshadow I have, so I cannot really generalize about the whole range, but Uninterrupted has a much smoother texture and seems much more pigmented than most other regular MAC eyeshadows I have tried so far. On my darker eyelids, I can use this as an all-over lid color - it covers all the ashy-darkness on my lids and ends up looking quite similar to my skin tone. Much better than using a concealer. In the pic below, I have used Uninterrupted as lid color - the darker shade used is MAC Typographic. 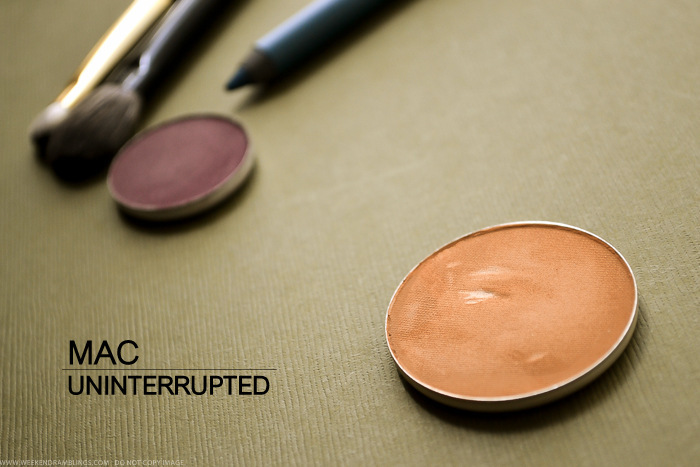 Uninterrupted is also great for using as a blending/transition color for smokey eye looks. Wearing MAC Uninterrupted as over the lids, MAC Typographic along lashline. 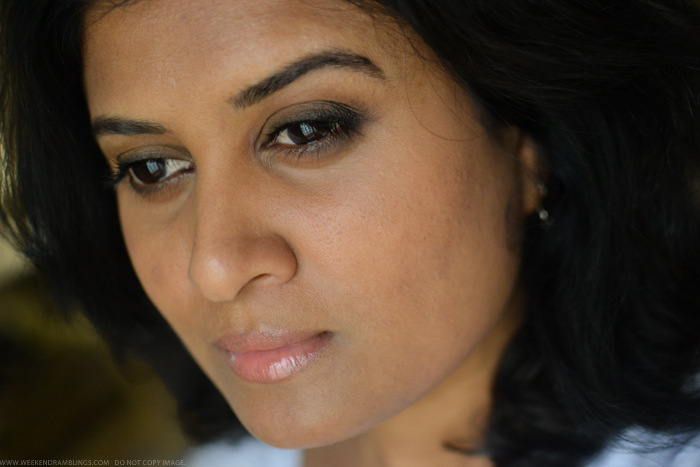 I love brown eyeshadows, so I am a bit biased in considering MAC Uninterrupted a must-have. That said, this is a great color to use whether as an all-over lid color or as a blending color, and the texture and color payoff is pretty awesome. Do give it a try the next time you are at MAC. Also, check this video - Sepia eyeshadow look by Sam from Pixiwoo - my favorite makeup tutorial using MAC Uninterrupted. I sure will check out this e/s. Looks nice. Am sure you will love the color, Eesha! this is in my wish list! love such shades!